Place a bid for the chance to own this rare promotional art collectible from the fraktastic Syfy smash BATTLESTAR GALACTICA — and support one of my favorite charities in the process! In celebration of the beginning of the fourth season of BSG in April 2008, Syfy had the cast pose for this dramatic “Last Supper” recreation (first seen by the general public in Entertainment Weekly’s January 11, 2008 issue). Lucky TV journalists like myself were gifted with this rare collectible art print. This limited edition piece is framed and double-layer matted. For more details on this incredible BSG momento click here. 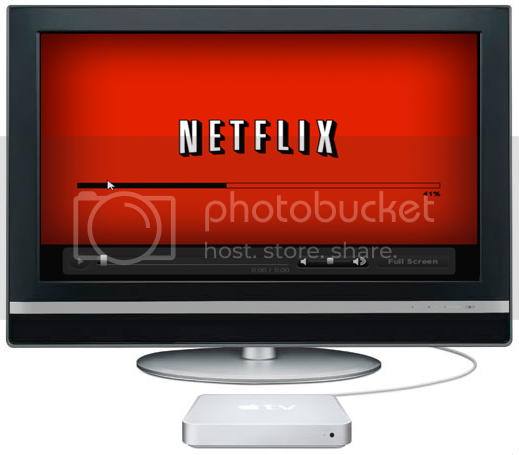 The frame measures 16 by 20 inches, and the art within the matte is 13.5 by 9 inches. This piece is numbered 886 out of 1850. Also check out these promotional screener DVD packages from season 1 and season 3. And attention Browncoats, check out this awesome unopened press kit Firefly cargo crate. The auction ends soon, so hurry. 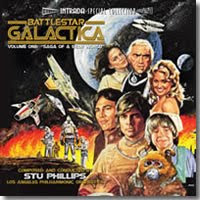 World premiere release of complete Stu Phillips soundtrack from 3-hour pilot episode of costly, spectacular Universal sci-fi series starring Lorne Greene, Richard Hatch. Complete 1/2" multi-track stereo session masters survive in perfect condition in vaults at NBC Universal, including all format music (main titles, bumpers). This first volume in ambitious CD series focuses on entire pilot score, includes both original opening sequence plus post-production edited version as well as composer's lively disco source cues heard during Carillon sequence, also presented in stereo. ("Love, Love, Love" vocal was not written by Phillips and was recorded elsewhere. It is not included here due to contractual reasons.) Phillip's prepared a 40-minute LP in 1978 using meld of soundtrack performances by full Los Angeles Philharmonic Orchestra, made at 20th Century-Fox Studios Scoring Stage, plus re-recorded cues by same players at later sessions.) Intrada CD presents every cue from LAPO recording sessions, premieres wealth of previously unreleased stereo music. For some episodes of single-season show, Universal commissioned new scores, recorded at Universal Scoring Stage with orchestras ranging from roughly 20-40 players, while other episodes simply tracked existing material. Multi-track stereo session masters were retained for many newly-scored episodes with other episodes stored in pristine condition on 1/4" mono formats only. Future volumes of this exciting Intrada series will cover remaining episodes from stereo session elements when they were made plus mono session masters when those were the only recordings prepared. (TV series, of course, was produced and broadcast only in mono back in 1978-79.) Stu Phillips supervised new digital mixes at Universal and editing sessions at Intrada, producing this definitive CD presentation of his landmark and justifiably famous score. Stu Phillips conducts Los Angeles Philharmonic Orchestra. First volume in series, released as part of Intrada Special Collection and limited to 3000 copies! Order the 76 minute CD and listen to clips here. I have the original soundtrack release of that album that came out in 1978 on vinyl, so an upgrade might be order. And thank the gods of Kobol that "Love, Love, Love" isn't on this new special edition. Syfy has cast Luke Pasqualino (Skins — U.K.) as Adama. 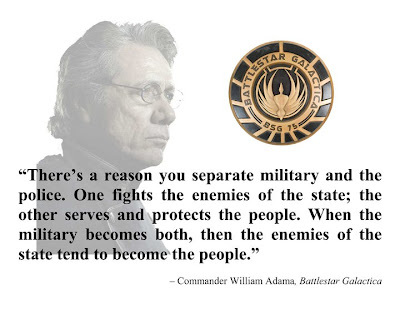 While Ben Cotton (Hellcats, Riese) is the other lead, playing Adama’s commanding officer. Blood & Chrome is set during the 10th year of the first Cylon war. The show will debut with a two-hour pilot on Syfy, executive produced by David Eick. 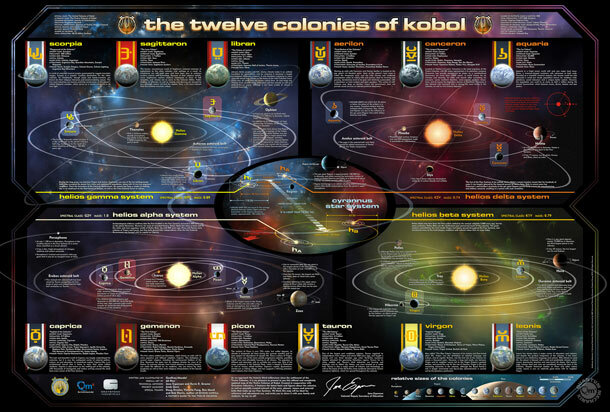 Check out this highly detailed map of the Twelve Colonies that you can order from Quantum Mechanix. 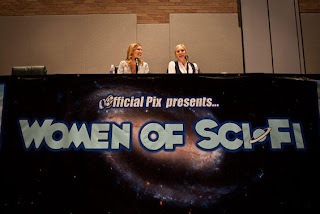 Katee Sackhoff and Tricia Helfer were recent guests at the Women of Sci-Fi Expo in Texas where they talked to fans and did an Acting Outlaws live stream. And Jamie Bamber has a new BBC show, Outcasts which looks to have some BSG qualities. Watch the trailer here.